55" Flat Screen Television! King size bed in bedroom and an additional queen size Murphy Bed overlooking the bay! Wireless Internet too! FREE long distance to US and Canada! Remodeled, very nicely decorated with travertine flooring, granite counters, stone fireplace, whirlpool tub, separate shower with rain shower head, wine refrigerator and bar, dimmed lighting throughout, feather bed with high thread count sheets, high speed internet access and more! Not to mention the panoramic bay view. Luxury all the way! 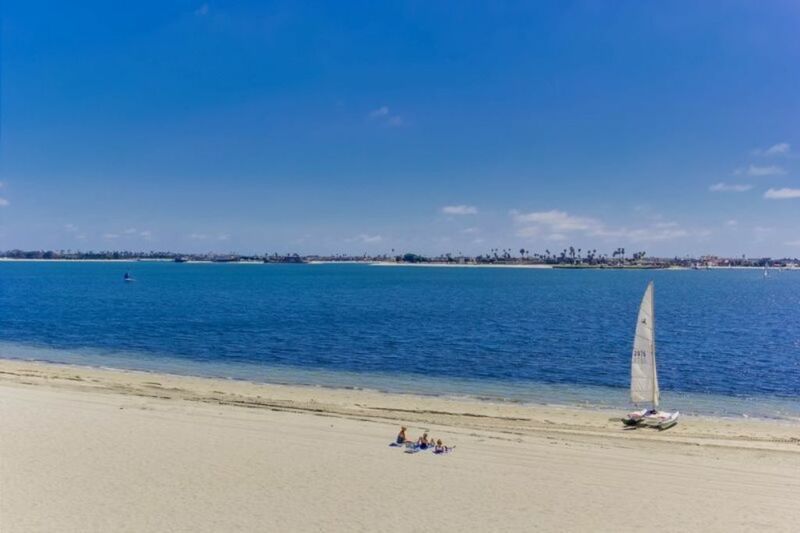 This large, upscale condo features a panoramic view of beautiful Mission Bay. A large glass sliding door opens up onto a balcony overlooking the boardwalk. Enjoy watching the sail boats, windsurfers, water skiiers and more! This home comes furnished with a King-size bed in the bedroom and a queen size murphy bed in the living room. Pets are NOT allowed, No Smoking. Enjoy many of the beach activities by day and watch the beautiful lights by night, while relaxing in front of our fireplace and taking in a DVD from our library. Underground parking with electronic gate for one car is provided. Two beach cruisers (bikes), beach chairs and a barbecue are included for your enjoyment. Need a larger place? Rent two, three or four units in this 22 unit complex. My friends have other rental units in this building so please ask and we may be able to accomodate you. I am really enjoying being a mom! It's my favorite thing. This was my personal residence from 1994 to 1998. I really loved living there! I felt like I was on vacation all the time! I love this place. The fabulous view! Being so close to the water! coin laundry room on each floor. 1 parking space in gated garage. This condo is fantastic! It is beautifully decorated on the inside (as pictured) and very well stocked for all of your needs. The views from the porch are wonderful and it is such a nice place to relax after a day of sightseeing. We enjoyed the two bikes provided and it is a quick ride (and not a bad walk) to Pacific Beach and Mission Beach when you are in the mood for some action before returning to the tranquility of this location. Robin is a wonderful host, who is easy to communicate with and provides you with all the information you need for a great stay. Highly recommend! The condo was immaculate and so close to everything we wanted to see and do. The owner was very quick to respond to any questions we had. She even recommended a pizza place. The condo has all the amenities you could possibly ask for. It is also in a quiet location but only a quick walk along the boardwalk to restaurants and shops. Easy drive to malls, airport, and attractions. We enjoyed our stay! Highly recommended. My husband and I loved the condo and the area. Great having the bikes to ride. Robin was great! Clean, fun area, great view!!! Nice clean property with a beautiful view. Great accommodations!! This is a nice quiet property that we thoroughly enjoyed! The sunsets were awesome and the property is well kept. Gorgeous, well-appointed unit with spectacular view and balcony, plus close to downtown. Well maintained, all worked according to the instructions sent by owner. Directly overlooks Mission Bay - wonderful sunset viewing from the balcony. Nice, secure garage with lock codes. Comfortable, clean, nicely furnished, full kitchen, a wonderful place to relax and unwind! Highly recommend. Very gracious and communicative owner. We’ll stay here again when we get back to San Diego! Great Condo right on the bay in a perfect area. Beautiful views. Convenient to many sights. We loved our week at this condo. It is very clean, looks just like the pictures. The boardwalk around the bay is right outside the back of the complex. So beautiful to walk there. Don't be scared off by the reviews of too many codes etc. Robin gives GREAT detailed information and once you are into the complex and in the condo the only code to remember is the code to your condo door. . We changed it to one we would remember easily. I also put all the codes in my phone just in case. Even though only 3 floors there is an elevator! We had no idea how close to everything we were. Coronado beach 20 minutes. Old Town, 15 minutes. La Jolla Beach where the seals populate (love love love) maybe 30 min max. Seaworld 10 minutes. You can see one of the rides at the park from the beach! Too much to do in 1 week! We can't wait to go back. Robin is awesome. Any question I had I emailed or texted and she immediately responded. The biggest treat is we could leave the sliding door wide open. Beautiful breeze coming in and never one bug! We hated leaving. You will love this place. Sea World, San Diego Zoo, Lego Land, Bicycling & Rollerblading! Add 11.05% tax and an 85.00 cleaning fee. There is a $300 refundable security/damage deposit. I take Visa/MC for your convenience. 7 night minimum. No smoking/pets Holiday Rates are slightly higher.